Rabbits definitely love their food and treats. Watching their little mouths munch away while enjoying their favourite foods makes your heart smile. Rabbits are full of character and you will see the funny side of their personalities spring to life when they know food & treats are about. 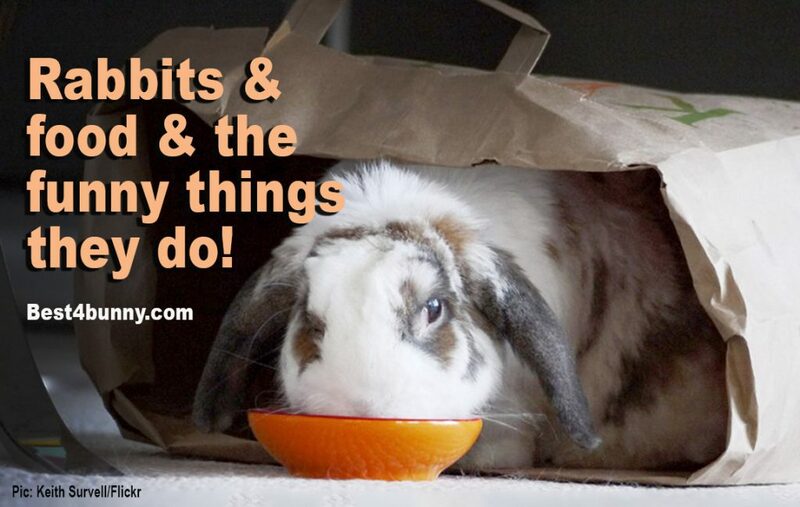 You will find out if you have a polite or a not so polite rabbit when it comes to meal times. Rabbits love a strict daily routine. Rabbits will learn the times that food & treats are served. Rabbits hate it when you are late. Rabbits are in charge when it comes to food. You may start to think your rabbits have turned into elephants with the amount of noise they make and the charging around that they do. Toys get thrown about & if you are not quick enough, they start to trash their homes too. Don’t worry, this is just a rabbits way of telling you to hurry up & don’t keep them waiting! A well mannered bunny will sit patiently waiting for their food. 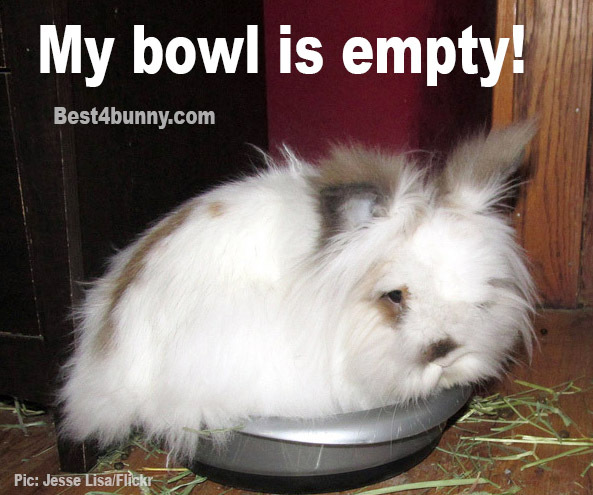 Many rabbits will dive head first into the bowl with the food in and make it very difficult for you to serve it. TOP TIP: Never place the bowl of food down as it is likely to get thrown up in the air by an impatient rabbit, resulting in vegetables and pellets all over the place. A well mannered bunny will wait patiently for you to serve the food. Some rabbits don’t like you looking at them while they are eating! As all bunny parents know, it is very important to check your rabbits are eating each & every day. But many rabbits refuse to eat while you are looking at them and will just glare at you until you move away. This results in many bunny parents finding a place to hide, that is out of view (or so you think), only to find when you peer around the wall or through the gap of the door, your rabbit is still glaring at you! Many rabbits don’t tolerate head rubs & bunny kisses while they are eating, but you just can’t resist! This is usually a big no no & many rabbits will let you know by grunting at you or turning their back to you or head butting your hand away. A well mannered bunny will pause eating while you give them a few head rubs or bunny kisses but you can’t help but feel they are just being polite and are secretly wishing you would hurry up & leave. Rabbits will let you know if they are disappointed with the choice of the daily menu you have served. If they are unhappy with the food served they will either refuse to eat it and glare at you in utter disgust or they will throw the food to one side in protest. It’s best to leave them alone to have their tantrum & 9 times out of 10 you will return to find all the food has been eaten, so it couldn’t of been that bad! A well mannered bunny will eat what is offered to them and you will get a feeling that they are very grateful. Some rabbits run off to stash some of their favourite food & appear seconds later to take more & stash that too, usually all behind their partner’s back. Some rabbits will take their favourite food or treat and run off to eat it in private. You will usually witness them running by you many times in all directions, as they cannot decide where the best place is to eat their favourite food! When rabbits are happily munching away & then suddenly stop when they think they have heard something. It’s like they are saying ‘what was that?’ Then continue munching again when they realise it was nothing. False alarm! Rabbits will try anything to get more treats. This can include using their cuteness and standing in front of you begging. Some rabbits will give you the bunny glare (this is when they stare at you for long periods with a look of disgust on their face). 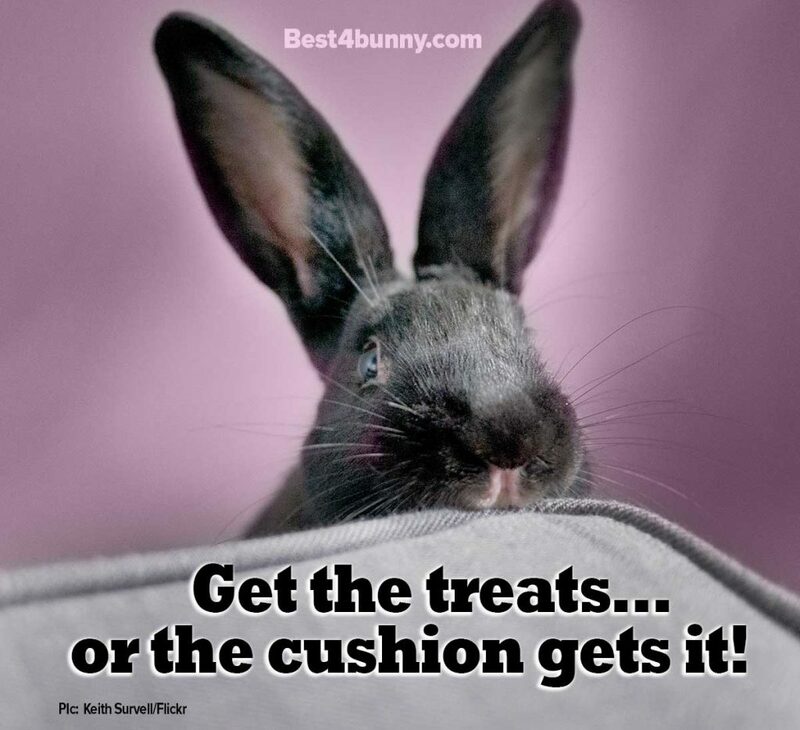 Some rabbits will even threaten to damage your furniture or personal belongings if they don’t get more treats! TOP TIP: Avoid eye contact and stay strong. Keep to the treat limit!